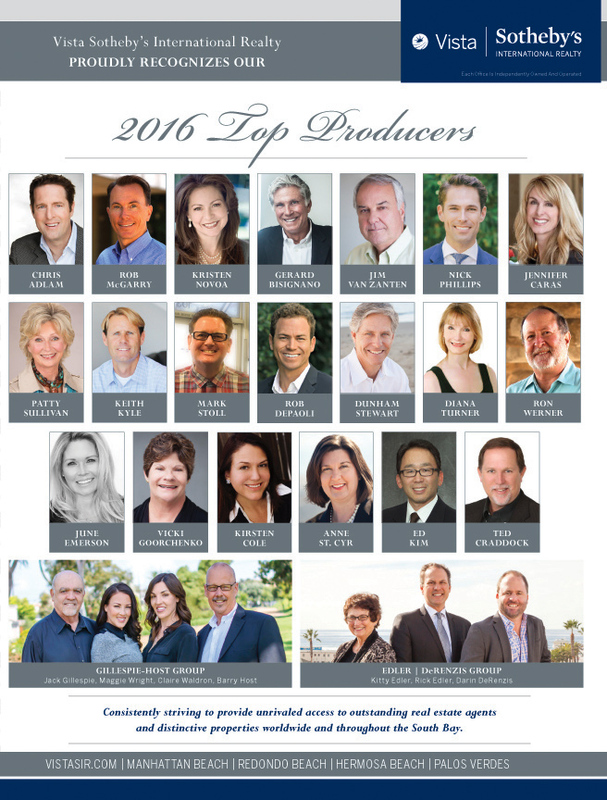 Vista Sotheby’s International, one of the top real estate firms in the South Bay area of Los Angeles have recently introduced their “Top Producers” for 2016. With offices throughout the area including Manhattan Beach, Hermosa Beach, Palos Verdes, Redondo Beach and the Hollywood Riviera, Vista Sotheby’s has quickly become the dominant force in the local real estate market. We are proud to annouce that Manhattan Beach realtor Keith Kyle was one of the top agents companywide and was the #9 top producing agent for 2016. Congrats to all of the realtors given the award. See also the Vista Sotheby’s top producers for 2015. We wanted to thank all of our clients and friends that helped make 2016 such as successful year in real estate.